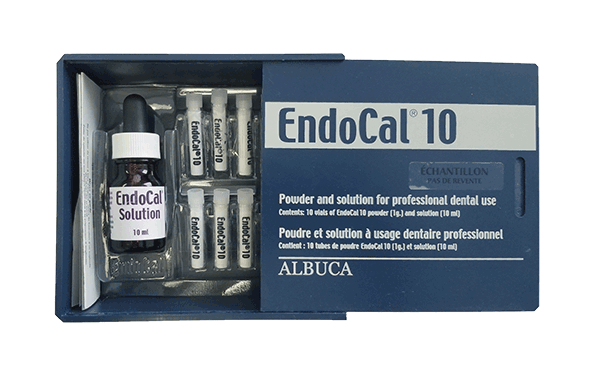 Due to its excellent hydric affinity, Endocal 10 heavy calcium oxide solution easily penetrates all tubules, even those usually inaccessible through compression of other root canal materials. As Endocal 10 penetrates the tubules, the body heat activates its ingredients, triggering a permutation process during which Endocal 10 lyses organic matter, permitting the total disinfection of the endodontic system. Permanent internal asepsis, as demonstrated and observed in many independent studies, is assured by Endocal 10’s alkaline pH. During the lyse of bacteria and organic matter by Endocal 10, the chemical reaction of the calcium oxide (CaO) with the water (H2O) and the residual carbon dioxide (CO2) results in the formation of CaCO3, or limestone, in the primary and secondary canals, forming a permanent natural obturation of the canals. Even if the actual failure rate of conventional root canals is only 10%, research by Dr Boyd Haley of the University of Kentucky demonstrates that approximately 75% of teeth treated by conventional root canal present signs of residual infections. Inversly, a study conducted in 1990 by Cavalleri and associates found that calcium oxide resulted in the perfect asepsis of the 58 teeth evaluated. Its use for all endodontic pathologies is endorsed by the International Association of Oral Medecine and Toxicology (IAOMT) as well as by the Quebec Holistic Dentists Association. Training & accreditation by ALBUCA is recommended and available. We have also created a training via the internet. Please contact us for more information.